Great Quest's flagship project - the Tilemsi Phosphate Project - is located in eastern Mali. The company reported an inferred mineral resource estimate of 50 million tonnes grading 24.3% P2O5. Encompassing 1,206 km², this deposit boasts a significant upside potential for naturally high grade phosphate rock. The Company owns 100% interest in all three properties, however, two Malian entities hold a 2.07% and a 1.07% net profit interest in the three properties. The Tilemsi phosphate project is located along the east side of the Tilemsi Valley, in eastern Mali, approximately 85 kilometres northeast of the town of Bourem, situated on the Niger River. The Tilemsi phosphate project is composed of three concessions: Tilemsi, Tarkint Est and Ader Foul, totalling 1,206 km². In 2008 Great Quest began to review phosphate opportunities in Mali. In 2009 the Company applied for and was granted the Tilemsi concession from the Malian Ministry of Mines. This concession is held in a Malian company, Engrais Phosphates du Mali SA (EPM), of which Great Quest holds an 94% interest. The remaining 6% interest is held by a Malian group. Field reconnaissance in 2009 confirmed the presence of extensive beds of phosphate rock. In June 2010 the Company announced an agreement to acquire a 97% interest in the Tarkint Est phosphate concession, immediately to the north of and adjacent to the Tin Hina concession. In November 2011, the Company expanded the Tilemsi phosphate project area through the acquisition of a new concession (Aderfoul) immediately adjacent to, and east of its initial Tilemsi concession. The new areas increased the total project area from 737 km² to 1,206 km². 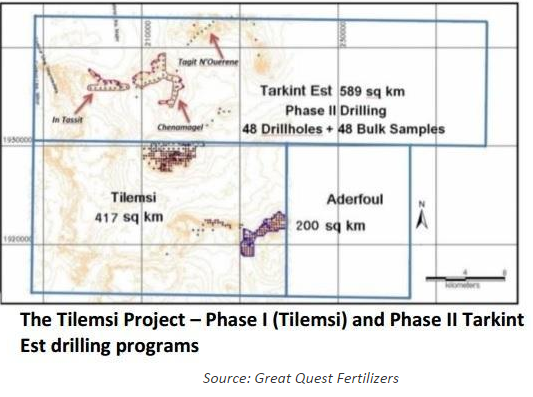 Based on earlier studies, Great Quest believes its combined concessions in Tilemsi offer considerable scope for defining significant phosphate resources. Important agricultural and infrastructure investment by foreign entities in Mali and its neighbouring countries indicate a growing interest in the potential for West Africa's agricultural sector. The growth in agriculture demand in Mali, and for phosphates worldwide, has resulted in new economic circumstances and the opportunity to re-evaluate the potential of the entire region for commercial deposits and development (source IFDC, 2006). The Tilemsi erosional valley exposes a half graben filled by Cretaceous and Tertiary marine and continental sediments. Four main deposits are known in the phosphate-bearing area of the Tilemsi Valley. These occurrences have been known since 1927-35. Detailed exploration was carried out in 1958 and 1959 by the Bureau Minier de la France d'Outre-Mer (A. Allon). Since then a number of studies and reviews have been conducted and are available the offices of the National Department of Geology and Mines (DNGM) in Bamako. Limited production of Phosphate Naturel de Tilemsi (PNT) was carried out a decade ago from a deposit to the north of the Great Quest concessions. Great Quest received in February 2011 the results of a remote sensing analysis conducted by GT-Imaging. The analysis for phosphate mineralization identified extensive showings along the fringes of low hills across both concessions. The findings require follow up field work but are consistent with the sampling carried out by Great Quest in 2009 and prior work done by others. Company sampling, reported earlier, found a range of phosphate grades from 5.11% to 33.05% P2O5; over 26 samples with an average of 24.5%. The remote sensing analysis suggests extensive apparent phosphate mineralization. The analysis and interpretation map showing locations suspected as phosphate on surface is found in "Tilemsi Project Remote Sensing Report." Decree granting the Tilemsi and Tarkint Est permits were issued on February 4, 2011 and October 7, 2011 respectively. Aderfoul exploring license application has passed through the interdepartmental commission on June 6, 2012. All three concessions have approved research permits that were issued under the 2012 mining code. The permits are in the name of GQ Mali, a subsidiary of the company. The Tilemsi and Tarkint concessions have been host to the Phase 1 (Tilemsi) and Phase 2 (Tarkint) drill programs. The phosphate deposits are sedimentary in origin, coming from a marine environment. They are similar to those that are found in Florida, USA and Morocco. Phase 1 and 2 drilling programs were completed in 2011 and enabled the publication of a combined NI 43-101 compliant inferred resource estimate of 50 million tonnes at an average grade of 24.3% P205 with a cut-off grade of 10%.